I participated in NaNoWriMo (for the first time!) this November, so I went into the month not expecting to get much reading done. I thought that setting aside time to write every day would cut into a lot of the time I normally spend reading, but I was really pleasantly surprised at how much I was able to read while getting a large chunk of writing done. Most excitingly, I read TWO five-star reads this month! I’m so picky that this is almost unheard-of for me, especially for a relatively lower-reading month. Don’t get me wrong, I’m impressed with how much I read this month, but it wasn’t quite as many books as I hit in a typical month. But TWO FIVE-STAR READS! Dang. I feel like a big part of the reason for that was that I didn’t set a big solid TBR for the month; I feel like maybe I read better books when I mood-read and don’t plan in advance. 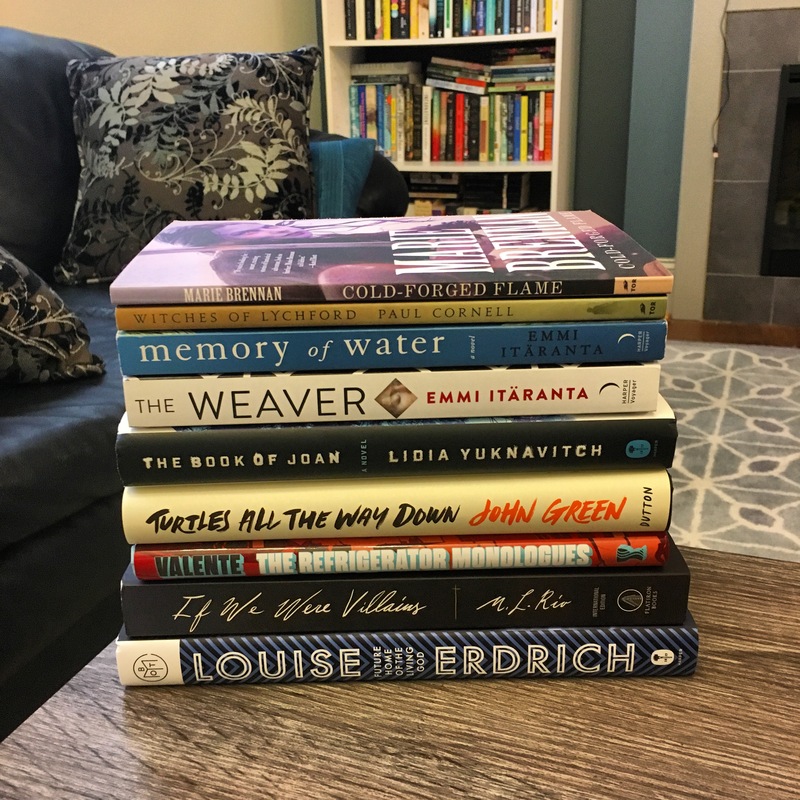 I’m going to be doing more of that going forward, although I did make a list of ten books I really want to get to this winter. The Refrigerator Monologues by Catherynne M. Valente (5 stars) – This book could not be more incisive or more timely. I don’t understand why it’s not more popular. Essentially, this book takes on sexism in the world of superheroes, by highlighting women whose lives (and deaths) have been used solely as plot devices to motivate the male main characters. If, like me, you really enjoy superhero movies and are also a feminist, this book will resonate with you. You don’t have to have extensive comics knowledge to enjoy this book or to get most of the references (I certainly don’t); I’m not familiar with every character they referenced, but enough of it is mainstream, like riffs on Batman and Harley Quinn, that you’ll get it regardless. The book’s premise is that in the afterlife, here called Deadtown and expressed as this gorgeously banal yet macabre city, women who have been involved with superheroes gather as what they call the Hell Hath Club and tell their stories one by one. These stories are interspersed with life in Deadtown, which on its own would make a great book. I really wasn’t expecting to love this as much as I did. I both laughed and cried while reading this, and it’s very short. Highly, highly recommend. I need to read more from Valente, stat. The Stone Sky by N.K. 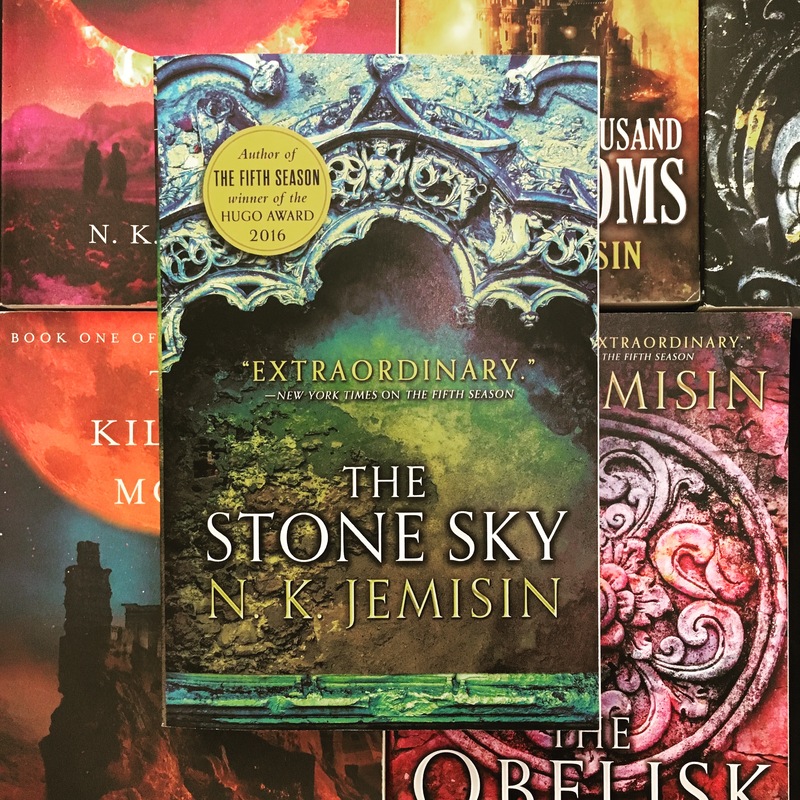 Jemisin (5 stars) – I definitely don’t want to give away anything about the plot of this book, since it would spoil the first two in the trilogy, but this was a very well-done and fitting end to the series. The world-building was incredible, and I was tearing up at the end. 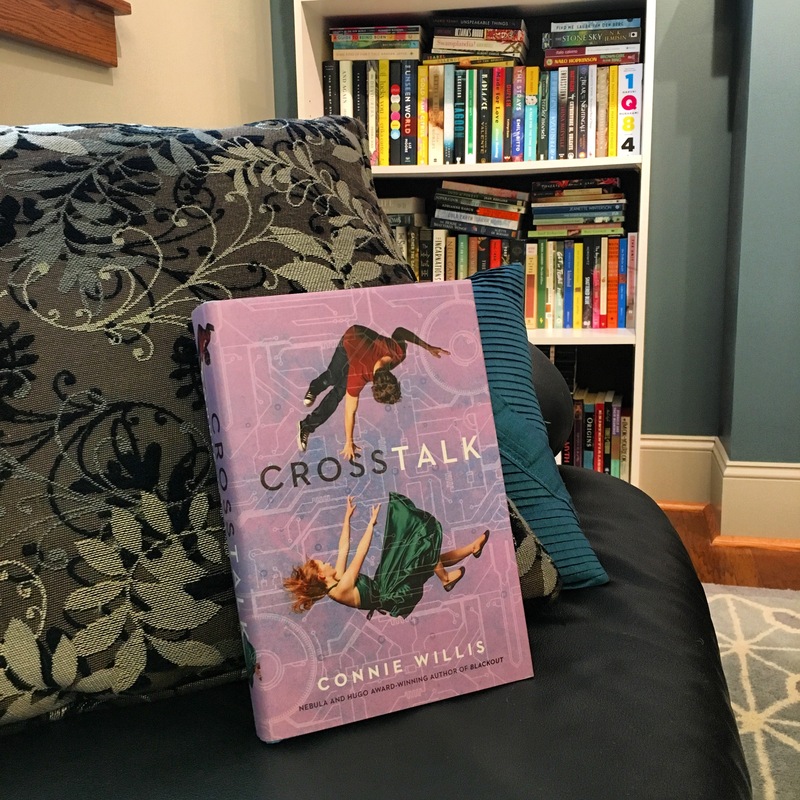 Crosstalk by Connie Willis (4 stars) – this is a cute, funny, fast-paced, highly entertaining SF rom-com. It was a lot of fun to read; the dialogue is great, and you really end up loving the main characters. This was my third Connie Willis book, and my second of her “lighter” books; I have two others on my physical TBR shelf and a bunch more on my hypothetical one. 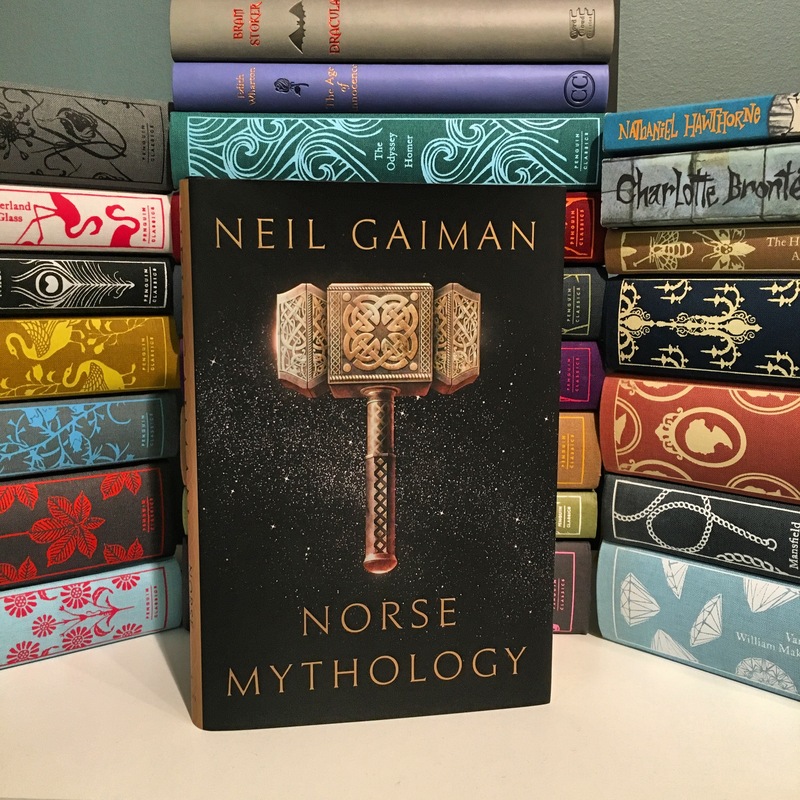 Norse Mythology by Neil Gaiman (4 stars) – I’ve always loved reading about mythology, although Greek mythology has always been my favorite, and this book was no exception. It was well-done and Gaiman also gave a great introduction talking about his connection to Norse myths. The parts about Ragnarok were particularly well-done. The Awakened Kingdom by N.K. Jemisin (3 stars) – this novella takes place after the Inheritance trilogy, and the entire plot is a huge spoiler. It was cute and fun to read, but it wasn’t as awesome as most of Jemisin’s work tends to be. I love reading challenges. I find they inspire me to read even more than normal, and I like the feeling of picking book options and going with whatever calls to me the most. I also get very Instagram-obsessed during these challenges because I love seeing what other people are reading. So far, days 1&2 of Bout of Books have been great, but the amount of reading I’ve done isn’t quite where I’d wanted it to be. It’s a good thing there’s still 5 days left 🙂 I ended up totally abandoning where I thought I’d go (of course) and not reading any of A Court of Mist and Fury OR My Brilliant Friend during the first two days; instead, I read a short novel and did some audiobooking. 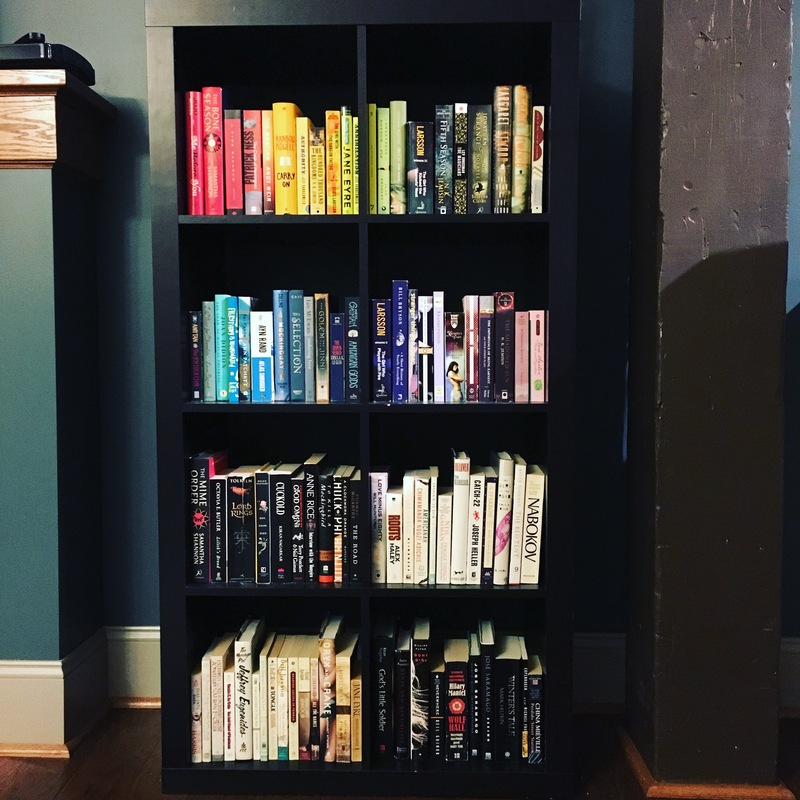 I participated in the #shelfieforboutofbooks challenges and posted a shelfie of my more organized bookshelf (my other bookshelf is not color-coordinated and the rest of my books are currently stacked on my breakfast bar and in piles in the closet, but this shelf makes me look super organized). This was a very short, philosophical novel about life, death, and art. 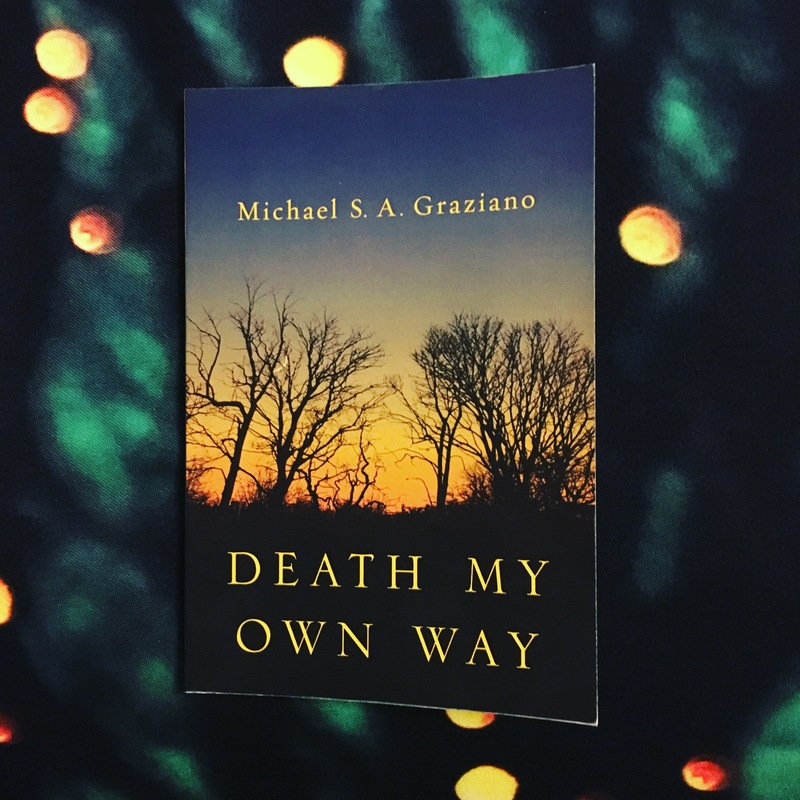 The premise is that a man with terminal cancer sheds his clothes and former life for an anonymous escape through Central Park; he proceeds to have various encounters that shape his thoughts in different ways. As a reader, you become immersed in the book very quickly, and it’s a good book to read in one sitting. It’s well-written and thought-provoking without being pedantic; in addition to its thoughtfulness, the book is very self-aware and there is a lot of humor. I’d definitely recommend this book; it would actually be perfect for the #Weirdathon! How is everyone enjoying Bout of Books so far?? To summarize: my reading week rocked! 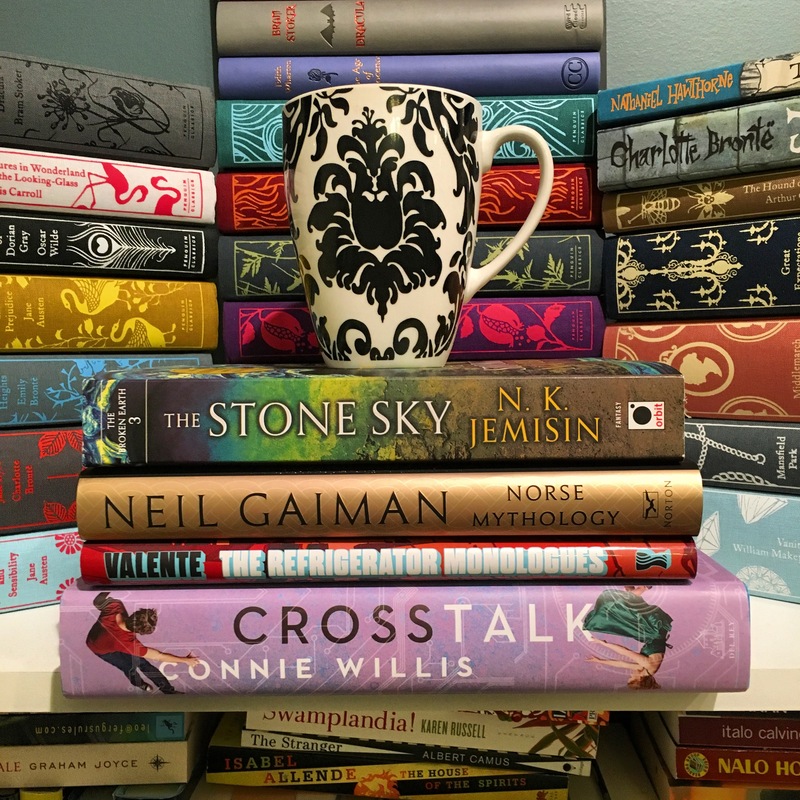 My reading this week made me so happy–I read two absolutely fantastic books this week! I am now going to start recommending them all over the place. 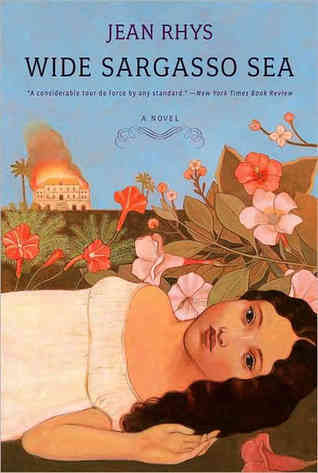 Wide Sargasso Sea by Jean Rhys: the language of this book is lyrical, and not a single word is wasted. I kept rereading sentences because of how beautiful the writing was, and it took me much longer to read this than I thought it would because I wanted to savor it. It’s a feminist reinterpretation of the “madwoman in the attic” aspect of Jane Eyre, and it discusses racism and sexism, both insidious and overt, through the story of Antoinette Cosway, daughter of Jamaican slave owners, who is later sold into marriage with a calculating Englishman. The story is incredibly sad and disturbing, but it feels like a very necessary discussion of the rarely explored aspects of classic literature. 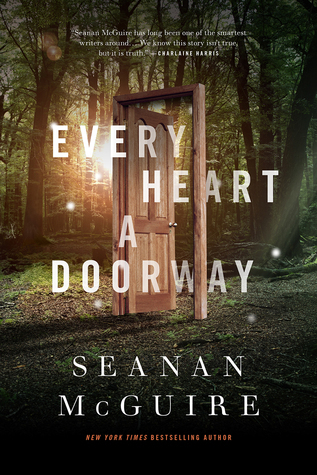 Every Heart a Doorway by Seanan McGuire: I become very easily hooked by any type of exploration of the fantasy/fairy tale genre, and this book was exactly what I wanted to read. The children in this book have all been involved in portal fantasy scenarios (where they have left the real world through magical doorways and emerged into their own fantasylands) but then, for various reasons, have returned (typically, they’ve been forced to return) to reality. I absolutely loved the hints at the different worlds the children went to, and I found the two main characters, Nancy and Kade, to be both intriguing and relatable. I really wish we’d gotten flashbacks to their times in their respective fantastical worlds, though. The hints were not enough! To be honest, I’d have read a much longer book on all of this and loved it, but the novella length did work well as it is. But I still wish it was longer. I bought the ebook of the second installment in Seanan McGuire’s Indexing series, which is about secret government agents dealing with out-of-control and deadly fairy tales snaring unsuspecting civilians. I was so pleasantly surprised by the first book (which is just called Indexing, and I highly recommend it) and I like this one so far as well, although it isn’t quite as surprising since a lot of the fun of the worldbuilding was already accomplished previously. Sadly, I DNF’d Jackaby, the audiobook I was listening to for the past few weeks (yet another abandoned audiobook for me, oh well). Then today I started listening to Yes, Chef, which is a memoir by celebrity chef Marcus Samuelsson. So far I love it. And still at the beginning of Mr. Splitfoot! 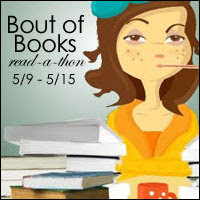 Dewey’s 24-Hour Readathon on Saturday! This week I’ll be posting about my TBR stack and Readathon plans. I can’t wait to hear about everyone else’s Readathoning as well.